Fill your kids' Easter with true meaning - and fun! As they open each of these twelve eggs they'll find a tiny symbol that tells part of the Easter story. Explanations and Scripture references are supplied in an accompanying booklet. Small parts. Ages 3+. About "Resurrection Eggs (12 Plastic Eggs)"
As children open each of these eggs to discover the object inside, they learn in a tangible, unforgettable way the true meaning of Easter. Each of the twelve eggs is filled with a tiny symbol that tells part of the Easter story. Included is an easy-to-understand booklet explaining how to use Resurrection Eggs, plus Bible stories revealing the significance of each object and supportive Scripture. 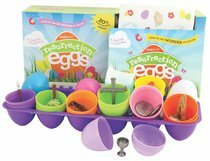 Customer Reviews For "Resurrection Eggs (12 Plastic Eggs)"
The eggs make it fun and easy to explain the easter story. The helping guide was also really interesting and good to understand. These are great! Much loved and anticipated by our children these eggs are a great way for the kids to remember the different stages in the Easter story. Each egg has a matching story and Bible verse that goes with the object inside the egg. Would recommend to anyone in a heartbeat! These are so good! I find that sometimes, especially for kids, having visual reminders helps to memorise the story better. The accompanying guide which takes you through the 12 pieces in the story is well designed, simple and to the point. A great resource to explain the Easter message from Palm Sunday to the resurrection of Christ. It includes a small booklet which is colour coded to the eggs which provides the story to each egg and where you can find it in the bible. I used this on Easter Sunday to tell the message of Easter to 40 children aged 3 - 14 years. As it is interactive, I had one younger child come up at a time and open an egg to discover what was inside and the older children reading the bible verses for each egg. A great resource to also use as a family or to allow your children to explain the Easter message to you! The pieces inside are of good quality and size. I highly recommend this resource to all Sunday School teachers, Scripture teachers and families.